Robert Stanbury "Buster" Olney III (born February 17, 1964) is an American columnist for ESPN: The Magazine, ESPN.com, and covered the New York Giants and New York Yankees for The New York Times. He is also a regular analyst for the ESPN's Baseball Tonight. Olney is one of about 575 voters for the Baseball Hall of Fame. He also hosts ESPN's Baseball Tonight daily podcast. Olney grew up on a dairy farm in Randolph Center, Vermont, which came in handy when he served as the "Cow Insider" for Mike Greenberg's milking of a cow on Mike and Mike in the Morning on June 21, 2007. He was educated at Northfield Mount Hermon School and Vanderbilt University, where he majored in history. As a child Buster was an avid baseball fan. At age 8, he developed an affinity for the Los Angeles Dodgers after reading a book about Sandy Koufax. Buster would later attribute his fanship as a reason for his journalistic career. After graduation, Olney began covering baseball in 1989, as the Nashville Banner's beat reporter assigned to the Triple-A Nashville Sounds. While in Nashville, he formed a close relationship with the legendary Don Meyer, Head Coach of the men's basketball program at David Lipscomb University. He later worked at the San Diego Union-Tribune and Baltimore Sun. He arrived at the Times in 1997 and in his first year won an Associated Press award. In 2004, Olney published The Last Night of the Yankee Dynasty, ISBN 0-06-051506-6, a nonfiction account of the Yankees' run of championships in the 1990s. The book also considered why the team lost to the Arizona Diamondbacks in the 2001 World Series and why it didn't win a championship between 2001 and 2003. Since leaving the Times, Olney has become a constant on the ESPN family of networks. In 2010, Olney wrote How Lucky You Can Be: The Story of Coach Don Meyer, an account of how a car crash and cancer diagnosis affected the life of the highly accomplished college basketball coach. In 2013, Olney delivered the May Commencement Speech at Northern State University, where Meyer coached until 2010, and was still a member of the faculty until his death on May 18th, 2014. Olney resides in Yorktown Heights, New York, with his wife, Lisa. 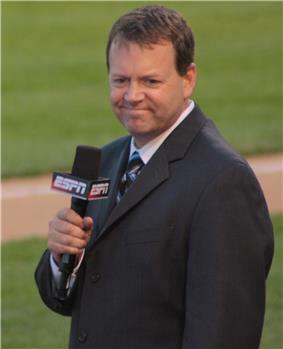 ^ "ESPN'S Buster Olney Plays Not My Job". NPR. Retrieved 21 May 2010.